Two-part, high-build epoxy barrier coat provides exceptional corrosion protection on aluminum boats, pontoons, and underwater metals. Compatible with all antifouling paints and other one- and two-part finishes. Use above and below the waterline. Bonus: Each Gallon order includes a paint roller frame, 3/8 in. nap solvent-safe roller cover, metal tray, stir stick, paint suit, & a pair of latex gloves. Each Quart order includes a stir stick and a pair of latex gloves. It’s a universal truth—you can’t just go slapping paint on aluminum and expect it to stick. You need to start with clean, bright, shiny, BARE aluminum that’s completely free of oxidation and surface contamination. It’s also really important to etch the aluminum surface just enough so the paint has something to cling to. We get it, so we developed TotalBoat Aluminum Boat Etch Wash and TotalBoat Aluminum Boat Barrier Coat. The etch wash cleans, conditions, brightens, and etches the surface to ensure excellent adhesion. The barrier coat primer prevents corrosion and provides superior adhesion for antifouling and other 1- and 2- part paints. Corrosion on metal boats and boat parts is a certainty. In saltwater and in warmer temperatures, even stainless steel is subject to crevice corrosion, which forms anywhere water can enter, but can’t exit, such as boat propeller and shaft assemblies. Crevice corrosion also eats aluminum alloys wherever there’s a juncture that lets saltwater enter, such as any place where objects are attached to the aluminum surface above or below the waterline. The zinc chromate primers used previously have fallen out of favor for use under antifouling paints due to expense and environmental concerns, and you would never have applied them to underwater metals anyway because of galvanic corrosion. TotalBoat Aluminum Boat Barrier Coat prevents corrosion above and below the waterline effectively so your boat—and your paint job— will look better and last longer. 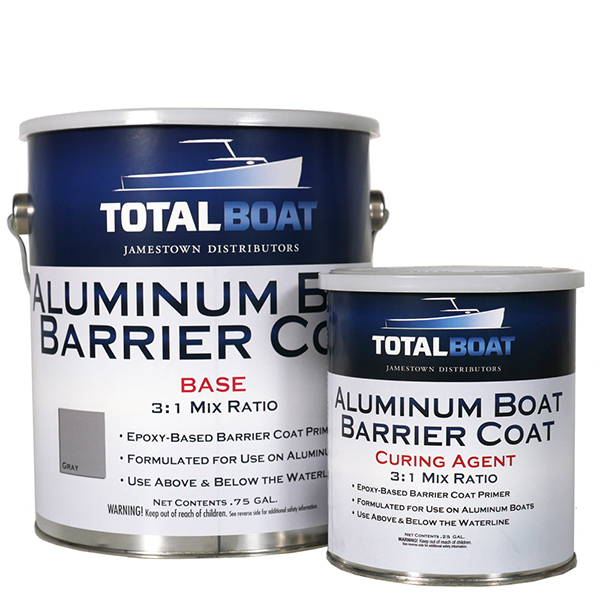 TotalBoat Aluminum Boat Barrier Coat is easy to mix and use. But if you’ve never applied a barrier coat before, you may want to start with a test batch to hone your technique. Just measure three parts base with one part curing agent in a paint pot. For example, use a graduated cup to measure 12 ounces of base to 4 ounces of hardener, and mix thoroughly. Accurate measuring is easy to do, and it’s important because with smaller amounts of base and curing agent, slight deviations in the mix ratio make a big difference. Don’t be intimidated by this, just be aware of it. Otherwise it’s easy to mix the entire batch at once. Simply pour the can of curing agent into the can of base. There’s enough room in there. No need to grab a separate container for mixing. To prevent waste, mix only the amount of Aluminum Boat Barrier Coat you think you can use before it kicks, which is 5 hours—a long time compared to other products. Preparing, priming, and painting aluminum is definitely a DIY job, but there are a few timing factors you should know. After applying TotalBoat Aluminum Boat Etch Wash according to directions and drying the surface, you need to apply Aluminum Boat Barrier Coat within 1 hour of metal preparation, or aluminum oxide will form (yes, it happens that fast! ), and the primer will not adhere properly. Overcoat Aluminum Boat Barrier Coat with itself when the surface is thumprint tacky—your thumbprint can be seen on the surface, but no epoxy sticks to your thumb. If there’s epoxy on your thumb, it’s too soon to recoat. If you can’t see your thumbprint at all, you’ve missed the overcoat window. At 3 to 48 hours, Aluminum Boat Barrier Coat gives you ample time between coats as you’re building up the 4-5 coats needed for an effective barrier coating. If you miss the 48-hour overcoat window—no worries—just sand with 80-grit sandpaper to give the surface enough tooth for the next coat to adhere properly, wipe the surface with TotalBoat Special Brushing Thinner 100, then apply Aluminum Boat Barrier Coat. Use the thumbprint test again. You have 5 to 7 hours to apply antifouling paint over the final coat of Aluminum Boat Barrier Coat. Do it while the surface of the barrier coat is thumbprint tacky. After 7 hours, you will need to sand with 80-grit paper, and wipe the surface clean with TotalBoat Special Brushing Thinner 100 or TotalBoat Dewaxer & Surface Prep before applying a coat of Aluminum Boat Barrier Coat. Wait for thumbprint tackiness, then overcoat with antifouling. TotalBoat AlumiPaint AF offers superior protection against fouling on aluminum hulls and pontoons. For underwater metals, apply TotalBoat Outdrive AF antifouling paint. Allow 48 hours for Aluminum Boat Barrier Coat to dry, then sand with 320-grit sandpaper. Remove sanding residue with TotalBoat Dewaxer & Surface Prep and let flash. Apply topcoat according to directions. High-build Aluminum Boat Barrier Coat can fill tiny scratches, but it’s not a filler. For scratches, deformations, dents, and dings 1⁄16” deep or greater, use TotalFair epoxy fairing putty first, then sand smooth and overcoat. Dry time to overcoat (non-Antifouling/Topside Paint over Aluminum Boat Barrier Coat): Allow 48 hours to dry. Sand with 320-grit sandpaper. Remove sanding residue—wipe with a clean, lint-free rag dampened with TotalBoat Dewaxer & Surface Prep and let dry.